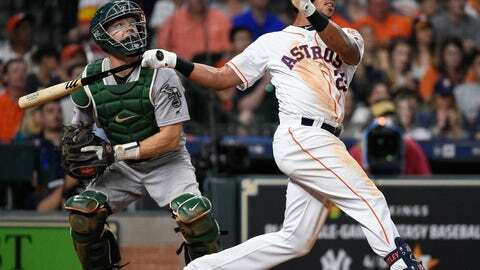 HOUSTON (AP) — Astros manager AJ Hinch wasn’t that concerned with the slump Michael Brantley was in early in his first season with Houston. “I wasn’t throwing a lot of strikes with the off speed so they could kind of eliminate pitches and sit on one,” he said. Grammy-nominated rapper Travis Scott threw out the ceremonial first pitch. Scott, whose latest album was titled “Astroworld,” also released a limited-edition hat line with the Astros on Saturday. The hats, which feature the Astros’ “H” logo came in navy, black and brown and featured stars drawn in his handwriting on the front and the words: “Wish you were here,” which was the name of his last tour, on the back. His pitch wasn’t quite as big of a hit as the caps, though, as it bounced wide right of the batter’s box.